After an X-Ray confirms a fracture, your doctor will request a cast be applied and will then probably send you to get it put on by an intern at the hospital. Chances are that the cast will not be waterproof and you’ll be severely hampered in going about your everyday activities. 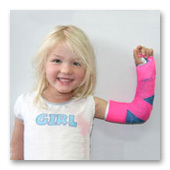 Our highly experience physiotherapists, on the other hand, are able to apply waterproof fiberglass casts to your fractured limb, quickly and effectively. These can be applied in a wide range of great colours for kids and adults and allow swimming and showering, making the recovery period so much less stressful.